There was an interesting thread on the Toy Trains Mailing List in which a few of the participants wondered when Williams Electric Trains began using the trade name “Golden Memories”. I bought this set of Williams passenger cars in the late 70’s from Doug DuBay (Doug's Train World). I am nearly certain this would have been either 1977 or 1978. The cars came in white corrugated cardboard boxes but, unlike Williams’ kit cars, they didn't have a photo on the outside. 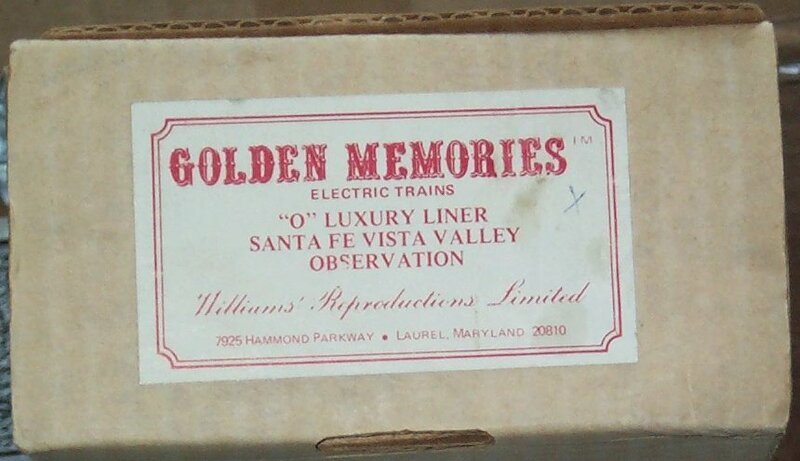 The outside of the box was labeled "Golden Memories Electric Trains". The lettering for "Golden Memories" uses an old-timey font similar to the one used by the Boston Red Sox on their home uniforms. The box was also labeled "Williams' Reproductions Limited", i.e., with the apostrophe. This is a neat little grammatical cue concerning the stage of development of Jerry Williams' company at that time: It lets us know that Williams had not yet morphed from a man to a manufacturer. The boxes were quite primitive, i.e., white corrugated cardboard, no foam insert, no window, just a white box with a white, hand-applied label on the flap. You can click on any of the photos below to see a larger image. The interior of the box contains a one-size-fits-all cutout template that would fit any 2500-series passenger car, vista dome or otherwise. The interesting thing is that the template contains cutouts for trucks, so these items were in all likelihood sold as RTR items, and not kits assembled by the dealer. 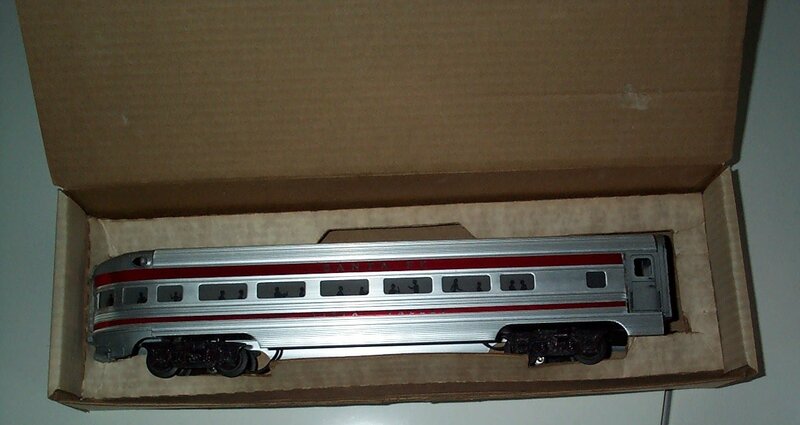 This picture shows the observation car from the set as it was delivered in the box. Please note that the internal box cutout for the car assumes that the car could be delivered as a ready-to-run item, and not always as a kit. My cars came preassembled, although I suppose it's possible that Doug could have made them up from the kits. The trucks themselves were reproductions of the original Lionel style found on the 2500 series cars, but had fixed, non-operating couplers. The box flap featured a hand-applied label with reddish lettering that also said "Golden Memories Electric Trains". The description of the item was "'O' Luxury Liner Santa Fe Vista Valley Observation". The company name of "Williams' Reproductions Limited" also appeared, as well as the company's address in Laurel, Maryland. The label on the box flap repeats much of the information on the top, but adds a description of the item. “Luxury Liner” was another trade name that would be later used by Williams. I've always wondered how many others are out there. I suspect I was one of the first customers for this series, because I remember that when I bought the SF extruded aluminum set, I had to wait several weeks afterward because the Lionel 2530 baggage car reproduction hadn't been finished yet by Williams, or at least that's what Doug DuBay said in a few letters. If anyone has additional information concerning these early Williams cars, please do not hesitate to contact us.